Two men travelling in a Singapore-registered Audi became embroiled in a physical altercation with the driver of a Malaysia-registered vehicle near Tuas Checkpoint yesterday around 5pm. An eyewitness claims that the Singapore commuters “physically attacked” the Malaysia driver during the dispute. Instead of following the other vehicles, the passengers of the Audi allegedly escalated the situation. 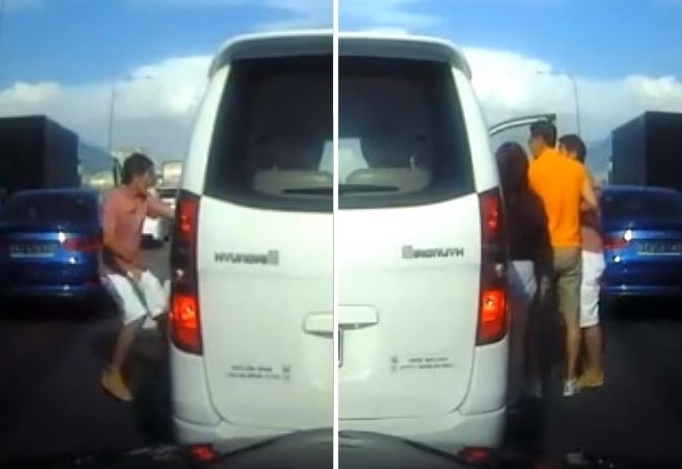 Lizzy shared: “The Audi driver and his passenger stepped out of their car and started to physically attack the Hyundai driver. It was unfortunate that the Hyundai driver did not lock his doors. Men exit Audi SKG6263B to 'attack' driver from both sides of his car near Tuas Checkpoint: https://bit.ly/2L7t9ZGA Stomper said: "I hope, through this footage, they will reflect upon their behaviour and stop being road bullies!" The video shows two men accosting the Malaysia driver after flinging his unlocked doors open. One man can be seen aggressively prodding the Malaysia driver repeatedly. When she reached Tuas customs, Lizzy allegedly got in touch with the Malaysia driver, an Indian man who apparently confirmed that he was physically attacked and hurt: “I managed to get in touch with the Hyundai driver, an old Indian uncle, at the Tuas customs. My intention was to share the video in case he wanted to make a report. “He confirmed that he was physically attacked and mentioned that his left ear was slightly painful. However, as he has a angmoh passenger on board, he was in a rush and seemed reluctant to pursue the matter. He also wanted to avoid trouble as he frequently enters SG-JB.